“People are always asking me if there’s anything I regret, or would change. 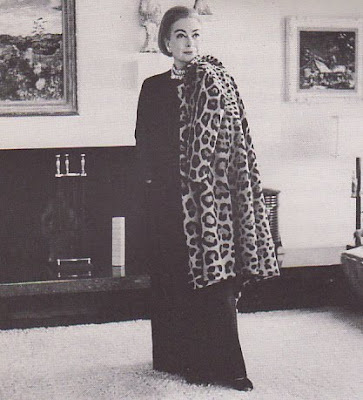 Hardly anyone alive remembers Joan Crawford. I can hear you all disagreeing as we speak. Think about it. Do you remember Joan Crawford or do you remember Faye Dunaway AS Joan Crawford? My guess is the latter. I also know that there are a few of you that would rather lose a finger than use wire hangers, so let he who is without sin…. 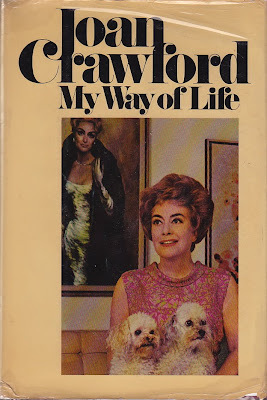 Truth be told (aside from what her kids thought of her), Joan Crawford was a force to be reckoned with. She was an actress who went on to be a formidable business woman in an age when few women would have entertained the idea. In 1971 she wrote a manifesto My Way of Life that she presented as, “a script for a complete woman.” Here are just some of her tips so you too, can feel complete. 1. I wouldn’t have –or be- a houseguest if I didn’t know the person very well. 2. I stay out of their hair. Color -- A red vegetable next to a yellow one looks unappetizing. Texture – Creamed chicken and mashed potatoes makes too much mush. Taste – Newer team two sours, two sweets, or two bitters. Balance – Courses shouldn’t be uniformly rich or light. People who have good taste are bound to make a mistake now and then, because they’re human, and when they do it’s a horrendous one. When learning stops, vegetation sets in. All very good advice. Now that wasn't so bad. Faye Dunaway should be ashamed. 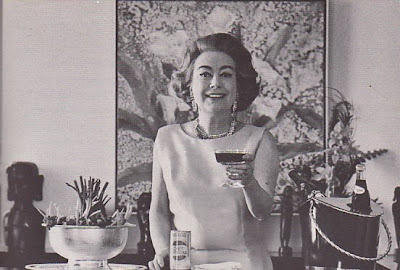 Every time you drink a Pepsi, I want you to think of Joan Crawford. If you drink Coke, you can think of those polar bears. Just packed Joan & the other Glamour Girls away until next Christmas. I do love her descriptive adjective of mush to describe cream chicken and potatoes. One tough cookie, I'd say. She is stunning in the first photo. When people invite themselves to stay, what is the politest moment to tell them about your 48-hour rule-and-no-exceptions?! seeing Faye Dunnaway in mommie dearest cemented her "wicked" personality in my mind. then seeing in her in some movies as: the women (1939 -- i think) didn't help. i have to ask: did she really cook from the menu? or did her help. sorry, i'm still trying to shake mommie dearest with your help. but i am still scared of her. What a riot! And what children say of their parents - well, let's just say it depends on the stage your at. What about adorable Bing Crosby and what his children "revealed"? Okay - I'm showing off my age if I admit I have watched a fair share of JC films. As a teen & a young woman, I find her scary (What About Baby Jane?) but mesmerizing. I had no idea though she had written a book and it was fun to read her quotes. Despite her failures of a parent, she was a tremendous actress.